Central Park is not the only place in Manhattan to witness Red-tails in love. For several years Inwood Hill Park has been home to a dedicated and successful breeding pair of Red-tailed hawks. Just like with Pale Male and Lola of Central Park, it is the bond that the Inwood pair have with each other and their dedication as parents that have captured the hearts of local birders and park patrons alike. Red-tailed hawks are generally monogamous birds, remaining with the same mate throughout the breeding season and often pairing for life, as do most birds of prey. A breeding pair of adult Red-tails looks to establish a large enough territory with suitable trees for perching and nesting, open areas to hunt and available sources of food like squirrels and rats. Once they’ve established their territory, they defend it from other raptors looking to set up their own territory. If they are successful as a pair, Red-tails usually raise two to three chicks a breeding season for many years. However, the 2007 breeding season looked uncertain for the Inwood pair. 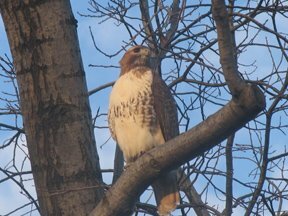 On December 2, 2006, a park patron observed a Red-tailed hawk stumbling around on the forest ground. He alertly recognized that this was unusual behavior for the species and called the Inwood Nature Center. Ranger Rob Mastrianni quickly responded to the scene and recognized the resident female hawk. The Ranger observed her from a distance close enough to monitor its behavior, but not so close as to stress it out. Ranger Mastrianni determined that the hawk was acting unusual enough to warrant immediate medical attention. As he approached the bird, it did not even attempt to move away. He gently covered it with his jacket because covering a raptor’s eyes tends to calm it down. After securing its razor sharp talons with a padded glove, Ranger Mastrianni held the hawk in his arms while Ranger Ricardo Amorocho rushed them to the Animal Medical Center. After some initial testing, the hawk was turned over to wildlife rehabilitator Bobby Horvath. The outlook seemed bleak. The hawk appeared to have a neurological disorder. Tests concluded that it had a dangerously low red blood cell count, which translated into anemia. The future of the Inwood couple hung in the balance. Bobby Horvath gave the hawk iron supplements and antibiotics. He had to force feed it because the bird simply did not eat on its own. After a few days of a high calorie liquid diet containing lactated ringers, the hawk started showing signs of improvement, but it was not out of the woods yet. The next step for the hawk was to demonstrate the ability to fly normally. Sometimes, sick or injured raptors never fully recover to the point where they are releasable into the wild and must live out the rest of their lives in captivity. After a few more days of the dietetic regimen, the hawk would be placed in a flight cage that is specially designed to allow room for practice flights. Only time would tell the outcome. At Inwood, the Rangers kept their fingers crossed. The male hawk was observed flying around the park by itself. A bird never looked so lonely. Almost as if word had spread in the classifieds about the possible real estate vacancy at Inwood, a pair of adult Red-tails was seen flying into the park to check out the property. Though this is part of the natural process of top predators living in the wild, it was hard not to sympathize with the resident male. It would be akin to Pale Male losing his mate (which has happened before), but also getting pushed out of his well-known territory by other Red-tails. At one point, the intruding pair was flying with Inwood’s resident male, making aggressive aerial displays toward the outnumbered hawk. All the signs were pointing towards an impending eviction. Meanwhile, back at the rehabilitation ranch, the female hawk was about to undertake her most important test. She was placed in the flight cage and began flapping her wings back and forth vigorously. Though determination is a human characteristic, it seemed as if this bird was determined to fly again – as if she wanted to see her mate again. It happened! The hawk flew to the end of the cage and back with noticeable energy. After continual observation of the bird’s flying capability, Bobby Horvath felt confident that the hawk could be released back into the wild where it came from. He placed a federal identification band on one of her legs so if need be, the hawk could be identified in the future. The final chapter in this story would be releasing the hawk back at Inwood, but one last question remained to be answered- would her mate, if he was even there, take her back after all this time? On December 14, 2006, the female hawk was turned over to Inwood Rangers Yekaterina Gluzberg and Jonathan Wells. They took the hawk into the woods and let her go free. She soared high on a four and a half-foot wingspan. But where was her mate? Did the other two Red-tails chase him away for good? After all the trials and tribulations of the past two weeks, it would seem tragic to have come this far only to fall short of the final hurdle of reuniting the two birds. Days went by, but only the female was seen in the park. Then days turned into weeks. The Rangers started to lose hope. But then, on the morning of January 5, 2007, more than one month from the day the female was first observed on the forest floor, both Red-tailed hawks were seen perched next to each other on a tree. It was the happy ending we were all hoping for. From that day forward, the two hawks have been inseparable- even more so than before. We can’t possibly know if the two hawks truly love each other. It’s easy to compare them to two people in love who were separated by circumstance only to be reunited and love each other even more. After all, that does happen in real life, not just in the movies. But what we do know is that the reunion of the Inwood Red-tails would not have been possible if it wasn’t for all the people involved in this story. The helpful park patron who first saw the female hawk. The wildlife rehabilitator who saved the hawk from almost certain death. And the Urban Park Rangers who faithfully assist animals throughout this great city, day in and day out. I don't often go out on a limb and take positions in the various struggles and disputes that go on in the hawkwatching world. Of course I'm not talking about clearcut  issues like the taking down of Pale Male & Lola's nest in December 2004. I was out there loudly protesting in my red bird suit, if you recall, along with everybody else. 1.Should the young bird have been just put back in the park? 2. Was it right to take the bird to a rehab facility to check it out? 3. Was a good rehabber chosen for the task? 4. Did the rehabber do the right things once the bird was in his care? 5. Did the rehabber return the bird to Central Park in a timely fashion? I stayed out of the frey for quite a while, accepting that the course of action taken was sensible and reasonable. My answers, as posted on this page, were No to #1, Yes, to #2 and 3. Then I went out on a limb. For question #4 I was critical of a photo published in the Daily News, of Bobby Horvath holding the young hawk in his hand. It seemed unnecessary handling by a human. Most experts warn against habituating temporarily captive birds to humans. I really didn't have enough evidence for my criticism there, and I shouldn't have commented on this. Thanks for a wonderful web site. One of the points that was made for keeping the fledgling for an interminably long time was to get the bird mature enough to be more capable of flying, and this is a legitimate reason to keep the fledgling in a person's care. Maybe this was correct after all. Good point. I probably shouldn't have rushed to conclusions so quickly. STILL...I can't help wondering about the big Press Conference that was held in the park on Tuesday to celebrate the bird's release. The Parks Commissioner, Adrian Benepe,  was there. The Urban Park Rangers were there. The press with their photographers and reporters were there. A number of hawkwatchers had been invited to attend. The question nagging at me is this: Doesn't it take at least several days to organize an event like this?, to write the press release, send it out, clear the Commissioner's schedule, etc. etc. It seems to me at least possible that the bird's return to the park was delayed by a few days in order to accomodate the park's desire for good publicity and photo ops. Since everything had a happy ending you might say "So what? The Parks Department and the Rangers  deserve some good publicity. A great park! etc. etc." But nobody could have been  sure, earlier this week,  that there would be a happy ending. Many of us worried that after a week the parents might not take care of a fledgling, and no one seems to have evidence that this is never so.I haven't heard of any precedents to this incident. Bobby Horvath, the rehabilitator, probably did not have a choice about this. He needed permission from the park to release the bird there. He probably had to accept a delay of a few days. And so I apologize to Bobby Horvath. I shouldn't have suggested that the delay was his responsibility. Basing my opinion on the present situation in the park where parents and fledgling are getting along perfectly, I'd say that everything Horvath did was well done. I had a unique run-in with two red-tails yesterday that just made my day! I had just covered a meeting in Queensboro Hall in Kew Gardens and was in my car heading home around 7 p.m., when suddenly a large bird swooped down in front of me. I knew it was a hawk, pulled over and watched the bird. It perched on the top of a low parking garage behind Queensboro Hall and then practically flew into a parked van's windshield, recovered and landed in a nearby tree. I got out my camera and took a few pictures. A woman came up to me who had also been watching them and told me they were the Briarwood eyasses, practicing their flying. Mom and Dad were nearby, as was the other fledgling. She said when the eyasses cried for food, the parents took care of them. As we were watching, a police car stopped, pulled over and one of the officers got out to look. He said he had been watching the hawks and was amazed they were 9-week--old babies because of their size. I was delighted that two wild birds would draw the attention of policemen. The officer was still there when I left, looking for the other fledgling. Kew Gardens is about 1/4 to 1/2 mile away from Briarwood and the area they were practicing their flying was quite urban---not a lot of open space. It looks like Queens is getting quite hawk-friendly. That's definitely a good thing! I will try to forward two of the photos I took. Hope this works. Where on God's earth have you BEEN? We've been looking all over for you! You'd better have a good story or you'll get what's for from Dad! Mom, I know you won't believe this but....etc. Be sure you check out Bruce Yolton's urbanhawks site -- link above. He includes some fantastic observations of parent-child interaction between the 888 7th Ave. fledgling, now happily back in Central Park, and the once bereft, now gratified parent hawks. Not only have the NYC red-tails---all of them---once again astonished me, so have the people and institutions. All of my concerns with the new fledgling have been propitiously resolved. And no, the hawk's contact with humans in captivity is no longer a problem. Whatever psychological problems this might have caused are now being eliminated by the resumption of natural feeding by the adults. The hawk is now psychologically re-connecting naturally with its parents. It will pass the summer learning important life lessons just as all the other Central Park fledglings have. Ranger Rob reports the parents caught a squirrel and are feeding it to the youngster. Around 4:45pm. So more good news. Bobby Horvath just called me. He'd just received a call from a Central Park Ranger who had spotted Charlotte sitting next to the eyass on the same branch near the ballfields at 3:30PM. The hawks then flew off together. He was told that the eyass was flying perfectly along with his mother. Oh BOY! Looks like it's going to work out after all!!! We'll see if feeding resumes, etc. but for now it looks like good news. Hazel Davies of the American Museum of Natural History, sent this notice round to all museum volunteers. It's from an article by Joe Rao of the Planetarium. Spread the word, he says at the end. So I'm spreading the word. So where and when should you look? Get outside this evening by 9:15 p.m. Get your eyes adjusted to the night sky. Then, start concentrating on the northwest part of the sky. Over toward the west you'll see the brilliant planet Venus (unmistakable) and above and to its left, the fainter planet Saturn. Less than an hour earlier, the Sun set will have in the west-northwest. So that's the general area of the sky to look. Both space vehicles will be moving along a track from Watertown, NY down to Cape Cod, allowing us to see them from our area. Spread the word and tell your friends and neighbors about this unusual sight. Fledgling back in Central Park! I don't know the details, and I don't know whether Junior and Charlotte have welcomed their offspring back into the fold. I devoutly hope so. I do know that finally, after an inordinately long spell at the Massapequa rehabber's place, the 888 7th Avenue fledgling is back in the park. An e-mail from Ben Cacace informed me that the young hawk was seen near the Hecksher Playground at about 3 pm. Ben, as you may know, was one of the first birdwatchers to become aware of a pair of redtailsmaking nesting attempts on Central Park South. That was many, many years ago. I think everyone now agrees that something went wrong in this episode. A difficult decision was made at the time the young bird was found to take it to a rehab facility and check it for injuries. This decision should not be faulted. It is easy to say "Oh they should have i put the bird back in the park immediately, not take it to Horvath's place" but imagine a scenario in which the bird then turned out to be injured. But the fact that the bird was uninjured should have been quickly apparent. The bird should have been returned to the park as quickly as possible. Everyone knew the area near 59th Street in the park where Junior and Charlotte cared for their fledglings two years ago. That would hve been a sensible place to put the fledgling after a day's absence. But for some reason this wasn't done. The bird was kept for more than a week. It was not isolated from human contact as it should have been--indeed a photograph of Bobby Horvath right next to the bird appeared in a newspaper yesterday. That was the moment when those who wanted to be fair to the guy finally turned against him. Well, he seemed to say to the press, the young bird might have wandered out into the street again. Or might have had any number of other mishaps. But such is the nature of first-year redtails: their survival rate is very low. To prevent the natural dangers fledglings face not what a bird rehabilitator is meant to do! Mistakes are made,.My hope is that something will be learned from it. As many have suggested, we need to have some protocols in place in case anything like this happens again.. I hope the Park Rangers, the NYC Audubon, and the park's capable hawkwatchers get together and plan ahead for fallen fledglings of the future. I'll keep you posted. Many people wil be watching during the next few days. situation will be no different. Feel free to send the petition, but we need no prompting in this area. In fact, I am sending you a recent photo of four peregrine falcon chicks born in a box nest on the Throgs Neck Bridge that we had constructed for them. I couldn't copy the photo of the falcons but be assured that they could get the gold at the cute olympics . When I returned to Astoria Park tonight, the large equipment was still parked at the base of the bridge but no work was happening as it was well past "quittin' time". The parents were hunting on the north side of the bridge working in tandem to snare pigeons flying north under the bridge (at least that is what it looked like to me). The babies were practicing flying as they otherwise quietly settled down like the sun. Early tomorrow morning I'll see if the MTA B&T is sincere. I want to sleep deeply tonight with the thought that the promise will be unbroken but I think I've lived in NYC long enough to know better. So, I shall let tomorrow bring the news of the day to me and I will pass it on to you. just sent in a link to an article in the Queens Chronicle about the Unisphere nest. Check it out. I've been in the country for the weekend, very peaceful and quiet. Had a nice time walking in the woods with my sister. Everybody needs a breather now and then! Now, back at my desk, I'm faced with a flood of letters, all anxious, some quite impolite and a few even abusive. Why? People think I can somehow do something about the Jr.-and-Charlotte fledgling situation. Well, I don't know much more than you do right now. My main source of information is the Daily News, not always the most reliable way to get the entire story but that's pretty much all there is right now. [BELOW, a link to the latest story.] I AM still trying to do what I can behind the scenes to help fix this regrettable situation. I had a call from a reporter on the NY Times while I was incommunicado this weekend [no cell-phone reception--no internet connection] and so I'm hoping they'll cover the story now. Playing answering-machine-phone tag with the reporter at the moment.